Declawing is a major surgery known as onychectomy, performed under anesthesia, that removes the tip of each digit (from the first knuckle out) of the cat's forepaws. 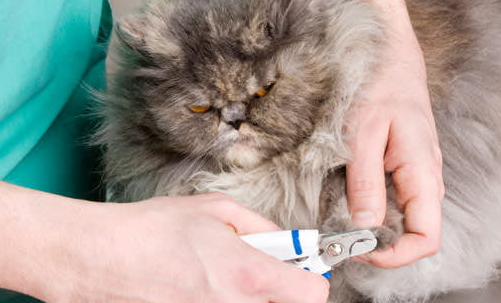 There is a slight chance of death in the surgery, and a declawed cat may have an increased risk of infection and life-long discomfort in its paws. This surgery is not recommended for an adult animal and is considered an act of animal cruelty in some countries (see below). People generally have cats declawed to prevent them from hunting and from damaging furniture. Rarely, vicious cats are declawed. In the United States, some landlords require that tenants' cats be declawed. 4. Can cause insecurity and a subsequent tendency to bite. This operation is rare outside of North America. In Finland, Germany, the Netherlands and Switzerland, declawing is forbidden by the laws against cruelty to animals. In many other European countries, it is forbidden under the terms of the European Convention for the Protection of Pet Animals, unless "a veterinarian considers [such] non-curative procedures necessary either for veterinary medical reasons or for the benefit of (the) animal". In Britain, animal shelters find it difficult to place imported cats that have been declawed and subsequently most are euthanized. An alternative to declawing is the application of blunt, vinyl nail caps that are affixed to the claws with nontoxic glue, requiring periodic replacement when the cat sheds its claw sheaths (about every four to six weeks). However, the cat will still experience difficulties because the capped nails are not as effective as claws. 0 Response to "4 Things to Think About Before Declawing your Cat"